People love to listen to stories. In ancient times, groups would gather to hear tales told by wandering storytellers or poets, and even today, millions of children get a nightly bedtime story before being tucked in. Movies, television shows and plays offer visual venues for "hearing" a story. Furthermore, the love of stories seems to transcend economics, cultures and geographic boundaries. Given the degree with which humans embrace stories, it only makes sense to use stories as a marketing tool. Combining this concept with the Internet yields the basis of digital storytelling as a marketing tool. What are the Elements of Digital Storytelling? First, there must be a story. The story must engage the viewer's attention quickly and hold his interest throughout. A great digital story is highly visual; it follows the "show, don't tell" principle. Keep in mind that great storytelling is an art that incorporates a variety of talents. 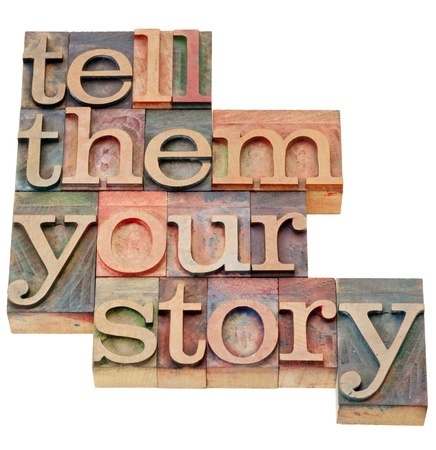 Great storytellers know how to involve their listeners -- how to connect with them, touch their emotions and trigger a desired response. The best storytellers use every element at their disposal, from sound effects to gestures, and they project a persona with which listeners can identify. A great digital story weaves together text, background music and images to present a total experience. What Elements Comprise a Great Digital Story for Marketing Purposes? The first element is a great digital story. However, when used for marketing purposes, an effective digital story needs to include additional elements. The story needs to present the "humanity" of the company. Consumers identify with other people, not impersonal corporations. Great digital stories for marketing personify the company's philosophies and core values. The story needs to inspire the customer's trust. Weave together elements that help customers form an opinion of the company's trustworthiness. For example, let satisfied customers present part of the story through testimonials. The story needs to touch a nerve. In other words, the story needs to offer a "hook" with which viewers can identify. Depending on the nature of the business, the story may be tailored to focus on a particular problem that the company can solve or appeal to a common desire. The story needs to let viewers fill in the context. Provide a basic framework, but leave the specifics to the viewer's imagination. The story needs to incorporate what the marketing department has already learned about the company's customers. Demographics, for example, might be used to tailor the story to a particular group. Complaints about a product can be addressed in a proactive manner. If the company or one of its products is trending on social media sites, this information can be used to create an effective story. Do make sure that the story is not inconsistent with other marketing efforts. Consistency across all platforms and campaigns is essential. Confusion can prevent conversion. This is not to imply that you cannot tailor individual campaigns to different groups. However, every campaign needs to reflect the same basic company values and enhance the brand image. Don't overwhelm the viewer. Long expanses of text can make the viewer more likely to abandon the story. However, too many images -- especially if they load slowly -- can also make them bail out in mid-story. Although images can increase marketing effectiveness, they need to be chosen carefully and used judiciously. Do optimize the story for as many different devices and platforms as possible. Keep in mind that many customers use their mobile devices to access the web and conduct research on products they are planning to buy. Regardless of how visitors arrive at the site, it is important to make a great first impression. Don't focus so much on the company that the customer becomes of secondary importance. Although the primary purpose is to deliver a marketing message, it must be delivered in a way that involves the customer. Otherwise, the story becomes little more than just another commercial. The average American is bombarded with marketing messages at every turn, and most consumers have learned an art of their own -- how to ignore sales pitches. A digital story, however, can engage them in a manner that leaves them more receptive to marketing efforts. This makes digital storytelling an art that every marketer should master.